Vacation is finally here, and my buddy Tony and I are heading to Chicago for the week to stalk the San Francisco Giants while they’re on the road playing the Loveable Losers, the Cubs. This is our fourth year going on a road trip with the Giants. In years past we’ve gone to Miami, St. Louis and last year Denver and Cincinnati. These trips have always been super fun, but this year is different. We’re going to Wrigley Freaking Field the second oldest park currently being used for Major League Baseball and it’s their 100th anniversary. Wrigley Field is just one of those very very special places in baseball history. The Cubs sadly have the moniker as the “loveable losers”, a team everyone loves even though they just stink most years. 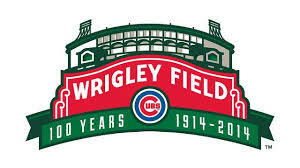 They have not won the World Series since 1908 and have not even been to the Fall Classic since 1945 although have made seven trips since 1908. Beyond all of this futility, it was not till 1984 that they even made the playoffs again. Since 1984 they have been to the playoffs six times and have only won one series back in 2003. Needless to say their habit of not winning can’t be matched by any other baseball team, there are a few that have never been or won a world series but we’re talking 40 years or less not 106. Ouch. So besides heading to Chicago to catch three Cubs games, we’re also going to a White Sox game as well. That being said we’ll also get a chance to sample some deep dish pizza, beer and get in a few sights too. I’ve only been to Downtown Chicago once and it was back in 1998. I was there for work, so I didn’t get much else in besides that, so to be able to get a week to see the city, eat food from some amazing places and check out the ivy in the outfield is just phenomenal. I’m so excited. Stay tuned for future posts on our flights out to Chicago, the amazing food, the hotel we’re staying at and of course on the games. Did I mention we’re sitting in a Luxury Suite one of the games? What what.